How Do I Know When My Car Service Is Due? Cars are generally very faithful and reliable pieces of machinery. You can stick with the same one for years and quite possibly find that it hardly ever lets you down. But like just about anything, if you ignore certain signs that something has gone, or even might go wrong, then you could be letting yourself in for a whole load of trouble. Think about it this way - whenever there’s something wrong with us or someone we love, we or they usually exhibit some giveaway signs which tell us that some expert attention, or perhaps even just a little TLC, is called for. The solution could be very simple - but if we ignore these signs, then the problems could start to mount up, and we could be letting ourselves in for more problems than we ever expected, or can handle. Well, that’s not always true, but it’s certainly the case that the technology which goes into our cars has come on in leaps and bounds in even just the past couple of decades. One of the principal reasons for this is so that faults can be spotted and put right before they become terminal. Many of the minor niggles which can arise with a car don’t, in themselves, have any major consequences. Problems really start to arise when one small problem is left unattended, and starts to cause other little niggles, which can eventually become a major problem. It’s the domino principle in action. So turning a blind eye to a warning light on your dashboard, or an untoward noise emanating from under the bonnet of the car which doesn’t go away pretty quickly is a bad idea. Think of it this way - a warning light is a message being sent to you by your car’s very clever electronic brain to tell you that something isn’t quite right. So first of all, you should be sure to read your manual, so that you know what all the different lights which might appear mean. It’s often the case that you can do something really simple to address the problem - it might even just be checking that all the doors and the boot are closed properly, or re-filling the washer bottle with water. But equally, there are visual warnings in those lights which designate something possibly unspecified, but which could be altogether more serious. So it’s unwise to turn a blind eye to an amber or red light on your dashboard, and a real help if you take the time to learn what each one actually means. For starters, it could be just a reminder that you’ve covered the recommended distance or the manufacturer’s suggested time period has elapsed since you last had the car serviced - and that’s easily solved, by making an appointment to get it done. At the heart of every modern car is a small computer, which is designed to keep an eye on all the major mechanical parts, and let us know when they detect that something isn’t quite right. Some of these will show when the next service is due by illuminating a light on the dash, or you might get an audible warning each time you turn on the ignition, accompanied by a reminder message in the car’s LED mileage display, which might read simply ‘Service’ or ‘Service due’. These handy little reminders are put there by the manufacturers to help all owners realise the benefits of getting their vehicles serviced on or around the recommended intervals. So don’t treat them as an annoyance - they’re certainly far less irritating than a repair bill of several hundred pounds or even more which has been caused or contributed to by you ignoring a little orange warning light! What If My Car’s Mileage Display Isn’t Digitalised? 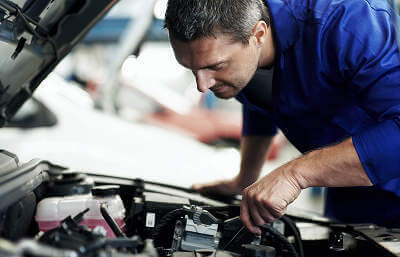 It should still be a straightforward matter of you knowing a little about your car, and the intervals at which it’s recommended to have it serviced. You’ll find this information prominently shown in the handbook, or you could try asking a friendly mechanic. Even if you resort to asking online, there’s a lot of knowledge out there, and if you don’t get it delivered right in front of you, you shouldn’t have to look too far to find the right answer for your car. Longer intervals between services are becoming increasingly common. And whereas it was once suggested that most cars were given attention every 5,000 or 6,000 miles, it’s by no means unusual for the latest models to only require attention every 12,000, 15,000 or even 20,000 miles. So it’s pretty understandable if you lose track of when you last had your car serviced - although if it was done properly, you should either have a record of its date and/or the mileage at the time in the service schedule book which still comes with lots of cars. Service Book - What’s One Of Those? Cars can also often pass through the hands of several owners in a fairly short time, so a service book can quite easily get irretrievably lost. But garages are well used to coming across this kind of situation, and finding clever solutions for giving drivers that useful reminder. We know of some garages which use very handy little stickers to remind drivers when their car was last serviced and what the mileage was at the time. They place these somewhere they will be regularly seen - inside the driver’s sun visor for example - once a service has been completed, with the idea that you get the details safely stored in your memory, and can get your appointment made in good time. If you use one of these methods, it’s also a good idea making a separate note in a diary or on a calendar straight after a service of when the next one falls due. However clever these stickers might be, they can quite easily get lost, of course. So whatever method usually works to help you remember important dates, you should consider the anniversary of your car’s last service one of these, and make sure you know at least a couple of weeks in advance when it’s imminent. The former is a vital annual test which has to be undertaken by every car from its third birthday. If you leave it that long before getting your car serviced, you’re almost certain to find that it’s well on the way to developing some serious problems - if it hasn’t been stopped in its tracks already! Your MoT test will only give you a snapshot of the condition of a number of safety-critical parts on your car at the time of the examination. And while you’ll get what’s known as an ‘advisory’, a written note showing items which the tester finds are acceptable to pass the test but which are reasonably likely not to pass the same test in a year’s time, that should be taken as a sign that those items will need to be looked at, ideally well before you take the car to be tested again. While many identical cars roll off production lines day in, day out, it’s what happens to those cars in the days, months and years after this that largely determines how reliable they will be, as well as what they will be worth to us when we want to sell the car or trade it in. So if you’re aware of the basic requirements for looking after your car properly - most importantly, of course, what the warning signals are that some form of attention is needed - you’ll set yourself up for getting the maximum amount of enjoyment from the freedom it brings. And what price can you put on that satisfaction? Do you stick by the tried and tested ways of remembering when your car is due for its next service - or do you have any unusual tips which guarantee that you have the date fixed firmly in your head? Let us know via Facebook or Twitter.